The areas listed below offer trails in some places, plus many opportunities for off-trail hiking, climbing and canyons exploration. There are several map links that will help locate these places. More Nebraska State Recreation Areas – Nebraska has many state recreation areas. This map link provides information on each of them. Some may have walking or hiking trails, but all are open to off-trail hiking. Wildlife Habitat Lands & Links: The lands below were purchased for the development of wildlife habitat by Platte River Basin Environments, Inc. These are open to the public, and though there are not many roads or trails, they are still open for off-trail exploration. The links provide a map and more details. 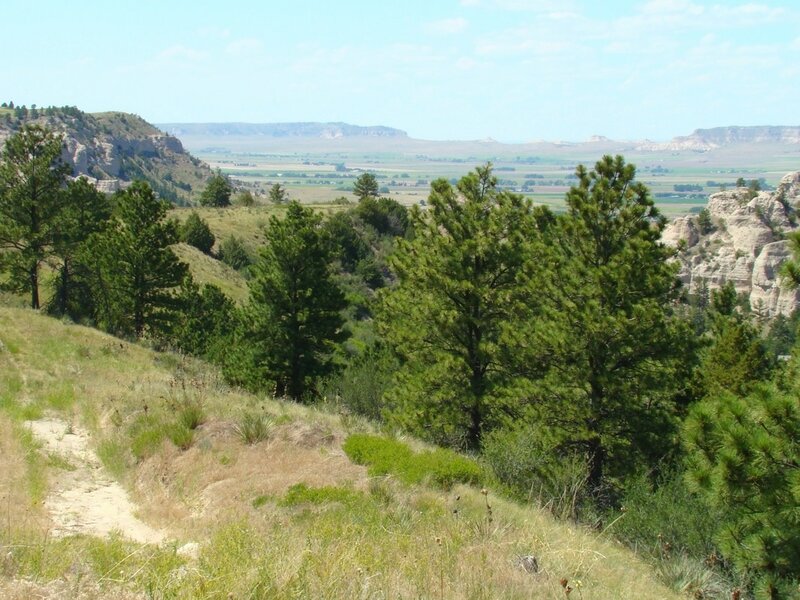 Buffalo Creek State Wildlife Area - located at Scotts Bluff County Road X and CR26. Cedar Canyon Wildlife Management Area - 4 miles west of Highway 71 on Carter Canyon Road, then 1 1/2 miles south on county Road 17, and finally 1 mile west to the parking area. 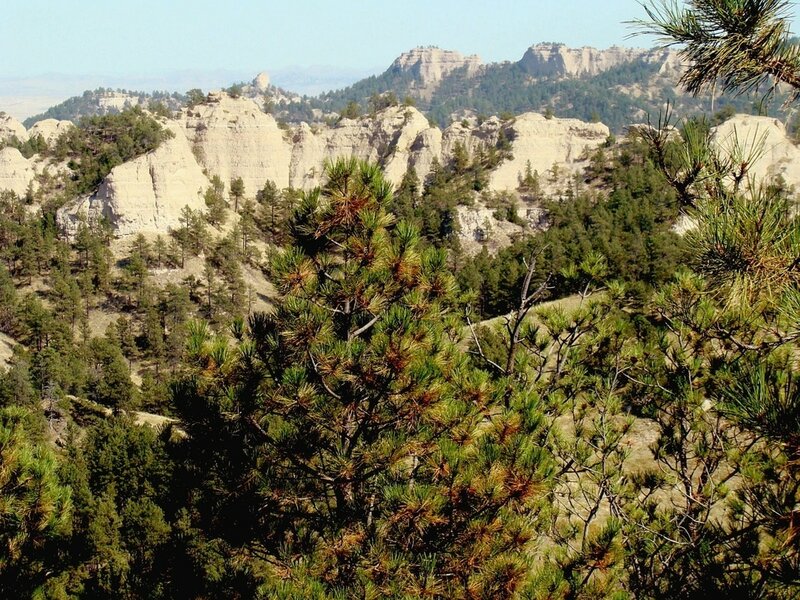 Bead Mountain Public Access Area - 3000 acres only for hiking, located seven miles southeast of Gering. 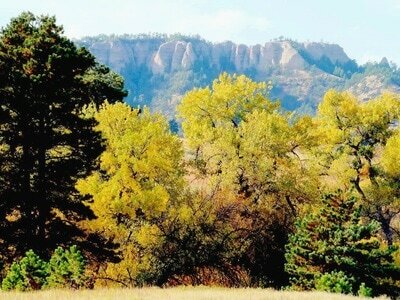 Montz Ranch – located 14 miles southwest of Morrill along Stegel Road. Carter Canyon - located 11 miles southwest of Gering and Scottsbluff, on Carter Canyon Road. TNC Murphy Ranch - this area is sandwiched between the Wildcat Hills State Recreation Area (SRA), Bead Mountain, and Buffalo Creek State Wildlife Area, and is accessible by the road going east from the Wildcat Hills SRA. Crescent Lake National Wildlife Refuge – This large national wildlife area north of Ash hollow has one trail. The rest of the area is open to off-trail hiking and exploration. This is a favorite for bird-watchers. Nebraska Wildlife Management Areas - Many of these WMA’s have old roads that can serve as hiking trails. The maps below show hiking routes at three different WMAs. A call or visit to a Wildlife Management Office will usually be very useful in getting some good advice for specific areas.